Rhys plays solo set on electric guitar, bass, alto and C flutes, trumpet through looper/delay system. Karkhana + Rhys Chatham Live in BeirutLabyrinths / Matāhāt is a series of international music events across London, Cairo and Beirut starting this autumn, co-produced by Nawa Recordings and 33:33 – the team behind London’s acclaimed St. John Sessions. 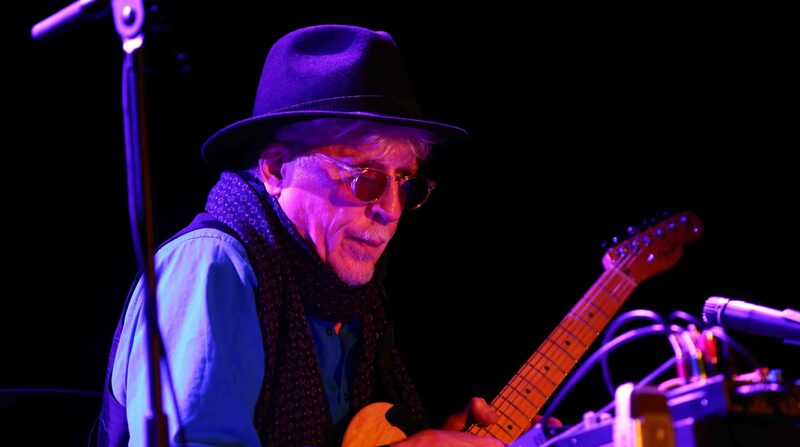 Rhys Chatham plays a solo set on electric guitar, alto and C flutes, and trumpet as part of the Zemlika Festival. After 5 years, we’ve finally broken our ‘no repeats’ rule. Rhys Chatham played the very first TUSK Festival in 2011 and gave us what remains one of the most joyous TUSK moments to date in the performance of his legendary Guitar Trio piece; leading a carefully recruited local group of drummer, bass and 8 guitarists, Rhys led from the front in a masterpiece demonstration of ecstasy in repetition at Gateshead Old Town Hall.Rhys will feature in one of the weekend’s first-time collaborations, thrown together with two other unfettered musical polymaths Oren Ambarchi and Sam Shalabi. We couldn’t be more excited about this, to us this is a group line-up direct from Fantasy Island. Rhys Chatham plays electric guitar, trumpet, alto, bass and C flutes through delays/loopers as part of the Tusk Festival at Gateshead Old Town Hall. Playing a duo concert next Thursday in the 20th arrondissement of Paris with Nico Guerrero-Vortex. We’ve worked up a set we’re really excited about and will be trying it out for the first time before a sympathetic audience. Please come if you’re in the Paris area next Thursday. Jean-Sébastien Mariage has agreed to open for us. The set will include Rhys on trumpet, then justly tuned electric guitar, then bass, alto and C flutes, finishing on electric guitar, all through my looping setup. Rhys Chatham plays solo set of 50-minutes on trumpet, electric guitar in just intonation, alto, bass and C flutes in the context of Fête de la musique in Geneva. Rhys, Rune and Jeppe first played together in the context of G3 in Denmark a few years back, and recently decided to do a reunion concert together. On this concert Rhys will be playing his current 2015 set on trumpet, well-tuned electric guitar, plus bass, alto and C flutes, all going through his delay-looper set-up. Accompanied on drums by Rune Kielsgaard and on bass by Jeppe Skovbakke. Playing G3 with local luminaries in Trondhiem, Norway. Rhys gives a talk in English before the concert. Rhys Chatham performs a new expansive work for trumpet/guitar/flute as Brooklynites Tim Dahl (bass) and Kevin Shea (drums) seamlessly juxtapose their charged retorts, all to create a grand dialectic of proportion and time in this exclusive cross-Atlantic collaboration. Rhys Chatham plays solo concert on trumpet, electric guitar in just intonation and flutes (alto, bass and C flutes). Also on the bill will be Istanbul-based Biblio and Lowcomittee, who hails out of Liége.